“As the cyber threat landscape continues to evolve and grow, Cybereason appreciates opportunities to engage with public and private facing stakeholders to share insights about the biggest cyber risks and how they can be minimized,” said Lior Div, CEO and co-founder of Cybereason. 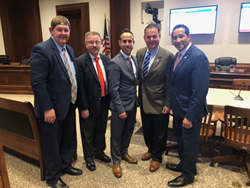 Cybereason’s CEO and co-founder Lior Div spoke recently at a public hearing of the Massachusetts Legislature’s House Committee on Technology and Intergovernmental Affairs. Div discussed Cybereason’s journey from Israel to Boston, the cybersecurity innovation ecosystem in Massachusetts, the company’s successful RansomFree and SecureMA launches and cyber threats that affect critical infrastructure in the Commonwealth. During the hearing, Liv discussed Cybereason’s RansomFree protection and SecureMA efforts. The SecureMA initiative convenes leaders from small businesses, nonprofits, local governments and law enforcement agencies on a quarterly basis to collaborate on combating cyber threats and establishes a forum to share best practices and resources. SecureMA is chaired by former Boston Police Commissioner Ed Davis and is open to the community. The most recent intelligence briefing in October focused on the spread of ransomware, and the actions that smaller organizations can take to protect themselves.